If your ideal wedding venue is beachside, yet close to Melbourne CBD, then Encore in St. Kilda is likely to be your first choice. Nestled in the iconic St. Kilda Sea Baths, this beachside wedding venue offers flexible room options that can suit all different kinds of events. Encore is back dropped by the swaying palms, glistening waters, kite surfers, and sailboats silhouetted against Port Phillip Bay’s stunning sunset and can be found just 10 minutes away from Melbourne city. 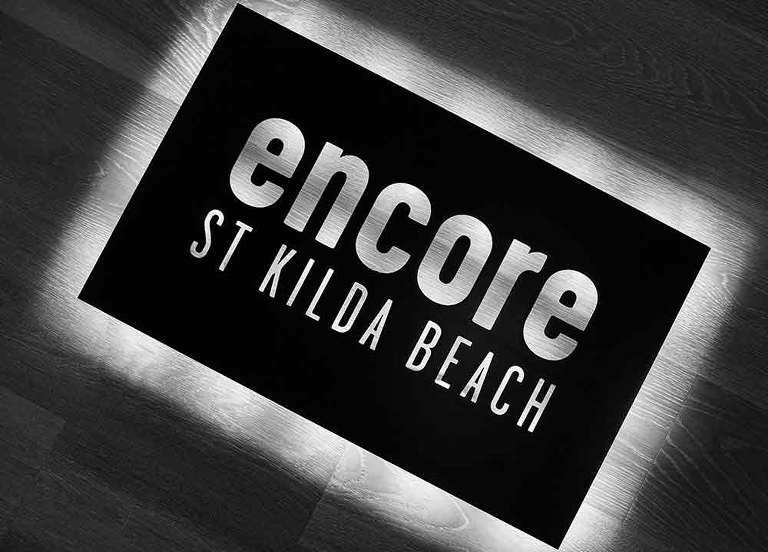 Encore is also strategically surrounded by some of the area’s boutique hotels such as The Prince on Acland Street , as well as close to several famous St Kilda after party venues, assuring you that the venue easily ticks all the right boxes for a great celebration. Aside from wedding receptions, Encore also offers enjoyable and professional service when it comes to other private celebrations like birthdays and other special events. Encore can cater for both major occasions and small and more intimate events. Encore basks in natural light, ideally combining modern décor with spectacular views of the bay. The venue also offers different types of catering packages and specializes in bespoke options which are guaranteed to meet every unique requirement. If you’re planning a cocktail party for your big day, you can also choose from Encore’s selection of large grazing dishes or cold or hot canapés. Or, if you would like to stick with the more traditional seated event, they also have a special selection of menus to offer with a buffet option available. Encore St. Kilda, recognize that all weddings are unique in their own way, and they have professional and dedicated wedding coordinators are fully committed to making sure that your day is as perfect as you imagine it to be, and are always on hand to answer questions. Encore St. Kilda is a chic beachside setting that is effortless, natural, and simple. Their main goal is to help clients create their perfect wedding with the best bay views in Melbourne. The place has a seated capacity of as many as 300 guests, while cocktail events can accommodate up to 700 guests. As mentioned earlier, more intimate spaces are available for those who prefer smaller weddings. All the rooms here have great natural light made possible by the floor to ceiling windows which offer uninterrupted views of St. Kilda Beach and Port Phillip Bay. The rooftop, courtyard, and beach offers a multitude of options for breakout areas and transitional spaces during your big event, as well as numerous options for wedding photos, before during and even after the wedding reception. Check out the other recommended Melbourne wedding venues.